1. Heat the mustard oil in a pan. 2. Add asafoetida, fenugreek seeds and cumin seeds. 3. When they crackle, mix in the potatoes, turmeric powder and salt. 5. Stir for a minute. 6. Add the remaining ingredients (except the green coriander) and boil the vegetables until they are cooked. 7. Stir well, crushing the vegetables with the back of the spoon to thicken the gravy. 8. Add the green coriander. 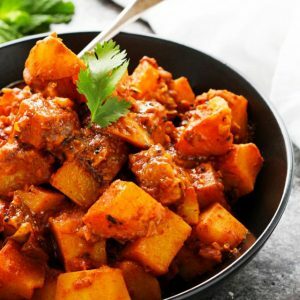 Feel free to comment or share your thoughts on this Aloo Golbheda Jhol Recipe from Awesome Cuisine.